Inductive – Declare answer first from observation, then proceed to prove; eg. mathematical induction. Deductive – Proceed to prove then find answer; eg. Sherlock Holmes, Clue. Answer is confirmed at the end. The abductive reasoning example clearly shows that conclusion might seem obvious, however it is purely based on the most plausible reasoning. This type of logical reasoning is mostly used within the field of science and research. Abductive Reasoning– In laymen’s terms abductive reasoning is an argument to the best explanation. It is a form of reasoning that concludes in an abductive argument of what is plausible or most possibly true. Abductive logic is also considered inference to the best explanation. It is choosing the most likely or best hypothesis or explanation based upon the (most) relevant evidence. Some people think that it is closer to inductive reasoning because it is not as sound logically as deducing an argument using pure logic as in deductive reasoning. Others think it is closer to deductive reasoning, because using sound logic one eliminates the most unlikely argument to come to the most reasonable solution. I like to call it, the best compromise between an inductive and deductive argument. Hence, a is a B. But not all inferences are of this variety. Consider, for instance, the inference of “John is rich” from “John lives in Chelsea” and “Most people living in Chelsea are rich.” Here, the truth of the first sentence is not guaranteed (but only made likely) by the joint truth of the second and third sentences. Differently put, it is not necessarily the case that if the premises are true, then so is the conclusion: it is logically compatible with the truth of the premises that John is a member of the minority of non-rich inhabitants of Chelsea. The case is similar regarding your inference to the conclusion that Tim and Harry are friends again on the basis of the information that they have been seen jogging together. Perhaps Tim and Harry are former business partners who still had some financial matters to discuss, however much they would have liked to avoid this, and decided to combine this with their daily exercise; this is compatible with their being firmly decided never to make up. Since Charles Sanders Peirce, it is standard practice to group non-necessary inferences into inductive and abductive ones. Read more on abduction from the Stanford Encyclopedia of Philosophy. Reductive Reasoning– Reductive reasoning is a subset of argumentative reasoning which seeks to demonstrate that a statement is true by showing that a false or absurd result/circumstance follows from its denial. It is proving a statement true by reducing to the opposite of it and showing the absurdity of the opposite result. It is logically reasoning to the absurd or reducing to the absurd; hence the name why reductive reasoning is also called Reductio ad absurdum (Latin: “reduction to absurdity”). Reductive Reasoning is also considered a mixture of deductive & inductive reasoning. Inductive, because it strives to prove understanding of what is likely to be true. And deductive because it does resemble traits of critically and rationally of deductively reducing down to a conclusive or non-conclusive argument. Fallacious Reasoning– Fallacious Reasoning is not real reasoning, it is the faulty premises for critical thinking and logic. One of the tall tell signs of fallacious reasoning is a logical fallacy. A fallacy is usually an error in reasoning and argumentation often due to a misconception, false premises, or presumptuous conclusions. Circular Reasoning is actually considered more of a form of fallacious reasoning. It would not be considered valid nor useful in a live debate. 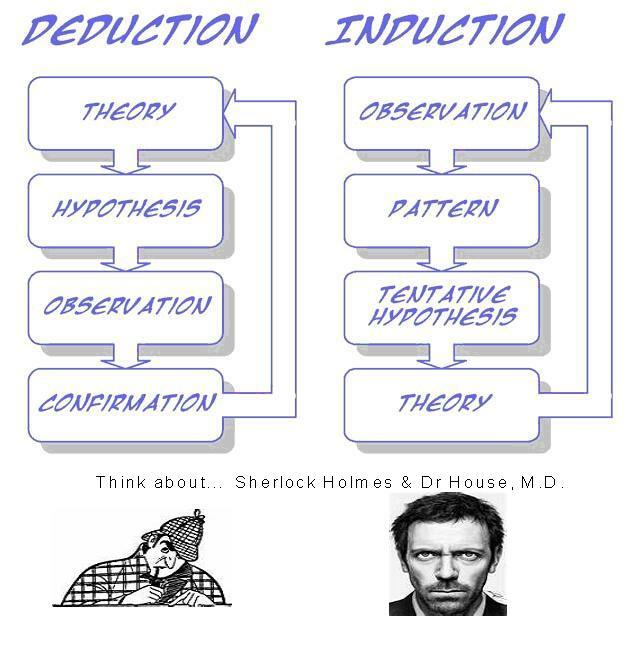 Deductive Reasoning: What is (absolutely) true? Inductive Reasoning: What is observably (most) true? Abductive Reasoning: What is most likely true? Reductive Reasoning: What is NOT true? Fallacious Reasoning: What you think is true? An analogy is a comparison between two objects, or systems of objects, that highlights respects in which they are thought to be similar. Analogical reasoning is any type of thinking that relies upon an analogy. An analogical argument is an explicit representation of a form of analogical reasoning that cites accepted similarities between two systems to support the conclusion that some further similarity exists. In general (but not always), such arguments belong in the category of inductive reasoning, since their conclusions do not follow with certainty but are only supported with varying degrees of strength. Here, ‘inductive reasoning’ is used in a broad sense that includes all inferential processes that “expand knowledge in the face of uncertainty” (Holland et al. 1986: 1), including abductive inference.